Painful stimulus that causes an organism to adopt protective behaviors that promote healing. Pain analogous to an alarm that signals actual or potential tissue damage, e.g., postoperative pain. Pain with a well defined onset associated with tissue injury from surgery, trauma, or disease related injury including inflammation. Pain proportional to trauma which decreases as healing occurs. Somatic nociceptive pain is often described as well-localized sharp, crushing, tearing pain that usually follows a dermatomal pattern. Visceral nociceptive pain is poorly localized dull, cramping, or colicky pain associated with peritoneal irritation, dilation of smooth muscle or a tubular passage. Nociceptive pain occurs in 5 phases: 1) Transduction, 2) Conduction, 3) Transmission, 4) Modulation, 5) Perception. Transduction begins when peripheral terminals of nociceptive C fibers and A-delta (Aδ) fibers are depolarized by noxious mechanical, thermal, or chemical energy. The membranes of these terminals contain proteins and voltage-gated ion channels that convert thermal, mechanical, or chemical energy into an action potential (AP). Nociceptor terminals are spread densely throughout the skin. 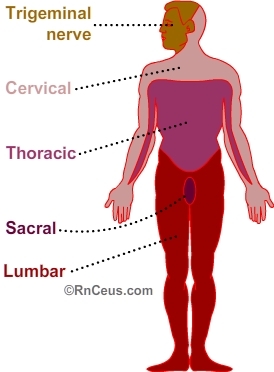 They are found less on periosteum, joints, tendons, muscles, and least on the surface of organs. Normally, nociceptor terminals have a high activation threshold. They requiring intense stimulation to generate an AP. For example, thermal nociceptors are only activated by temperature extremes (>45°C or < 5°C). However, nociceptors can be made more sensitive to stimuli. Injury to neurons and surrounding tissues expose neighboring nociceptors to irritating substances, including: neurotransmitters, ATP, prostanoids, bradykinin, serotonin, histamine, and hydrogen ions (acid pH), etc. These substances lower the nociceptor's activation threshold (sensitize), creating a condition of hyperesthesia. Hyperesthesia is a term that encompasses both allodynia and hyperalgesia. A common example of allodynia is the painful response to touch in an area of a 1st degree burn, e.g. sunburn. Normally, allodynia subsides as healing progresses. Hyperalgesia, on the other hand, results from prolonged hyperstimulation which can cause structural and functional changes to both peripheral and central neurons. These changes can cause central sensitization leading to the development neuropathic pain. There are 2 types of nociceptor fibers that conduct APs to the spinal cord. A-delta fibers (Að) are slow, thin, myelinated fibers associated with sharp/pricking, well localized pain. C fibers are very slow, thin, unmyelinated fibers that are associated with a dull, aching, throbbing, diffuse pain. 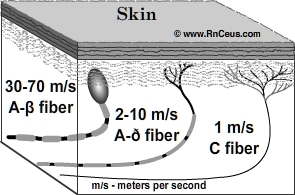 A third type of fiber, A-beta (Aß), is a fast, large diameter, myelinated fiber that carries APs from mechanoreceptors. Aß fibers are believed to modulate C and Að activity within the dorsal horn. The dorsal horn is divided into distinct gray matter laminae. Primary afferent presynaptic terminals project into specific laminae. Lamina I receives presynaptic terminals of Að and C fibers. It also contains second order neurons that project to the thalamus and relay to somatosensory cortex and cingulate cortex. Lamina II receives presynaptic terminals from C fibers which synapse on interneurons, many of which supply inhibitory signals to lamina I projection neurons. Lamina III receives presynaptic terminals from Aβ fibers and dendrites from lamina V projecting neurons. Lamina IV receives presynaptic terminals from Aβ fibers and dendrites from lamina V projecting neurons. Lamina V receives presynaptic terminals of Að and contains second order neurons that project to the locus coeruleus, parabrachial nucleus, amygdala and hypothalamus. Nociceptors serving the head and orofacial areas take a different path than from those of the rest of body. These nociceptors projects from the trigeminal ganglion and enter the CNS at the level of the pons. Trigeminal Að and C fibers pass down through the pons into the medulla where they synapse on second order neurons which then rise to decussate within the pons and pass to the thalamus. The first effect leads to a lowered activation threshold, a change in cation channel kinetics, and the insertion of more receptors in the postsynaptic membrane. The second effect initiates a cascade that results in the production and release of nitric oxide into the synaptic cleft. Presence of nitric oxide in the synaptic cleft causes an exaggerated release of neurotransmitters from the presynaptic terminal resulting in synaptic hyperexcitability. For our purposes we will focus on the processes that inhibit or suppress transduction, conduction or transmission, thereby interrupting or diminishing the perception of pain. a) inhibiting the sensitization of nociceptor terminals with medications such as cyclooxygenase inhibitors, e.g. aspirin, ibuprofen, etc. b) inhibiting depolarization and repolarization of the axonal membrane. 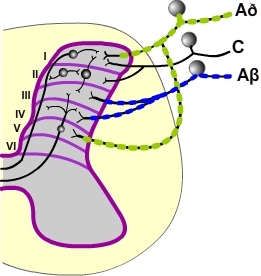 Local anesthetics like lidocaine prevent the generation or conduction of an action potential by blocking the influx of sodium through voltage-gated sodium channels located along first and second order afferents. a) Exogenous opioids like hydromorphone, morphine and oxycodone produce analgesia by mimicking endogenous endorphins. Opioids are able to activate the endorphin receptors: Mu, Kappa and Delta. Mu receptors are responsible for most of the analgesic effect of opioids and are present on neurons in the spinal cord, brainstem and midbrain. • In the dorsal horn, Mu receptor act by closing voltage sensitive calcium channels on the primary afferent presynaptic terminal. Blocking the influx of Ca++ inhibits depolarization and the subsequent release of the neurotransmitters glutamate and substance P. Mu receptors also increase the efflux of K+ from the second order postsynaptic terminal, which increases the internal (-) charge, creating a hyperpolarized state. c) Antidepressants are believed to enhance the analgesic activity of the descending pathway by increasing the availablity of synaptic monoamines. The monoamines serotonin and norepinephrine are the primary neurotransmitters released by descending pathway neuron terminals. Descending pathway neurons arise in the brainstem and terminate in close proximity to primary afferent terminals, interneurons and synaptic membrane of second order neurons located in the dorsal horn. Perception of nociceptive pain is dependant upon neural processing in the spinal cord and several brain regions. 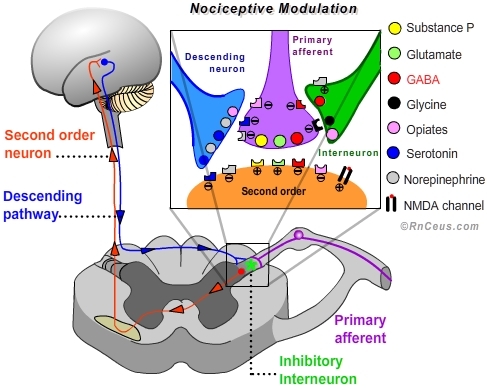 Pain becomes more than a pattern of nociceptive action potentials when they reach the brain. Action potentials ascending the spinothalamic tract are decoded by the thalamus, sensorimotor cortex, insular cortex and the anterior cingulate to be perceived as an unpleasant sensation that can be localized to a specific region of the body. Action potentials ascending the spinobulbar tract are decoded by the amygdala and hypothalamus to generate a sense of urgency and intensity. It is the intergration of sensations, emotions and cognition that result in our perception of pain. Positron Emission Tomography (PET) and Functional Magnetic Resonance Imaging (fMRI) have enable researchers to monitor perfusion, metabolism and the sequence of activity across multiple brain structures in response to painful stimulation. These tests demonstrate significant variation in the pattern, intensity and volume of brain activity between individuals exposed to similar painful stimulation. The findings reinforce the notion that pain is a complex individual experience that can not be quantified by anyone other than the person experiencing it. Post-operative pain is an example of nociceptive pain.